A knight is known to be the classic warrior who used to fight a battle with a horseback. If we talk about the Knight in the context of the military then the Knight is a honorary title, which is granted to the person who has rendered the services to the monarch or has served the church in the army limits. This honorary award is known as the Knighthood and is considered to be highly noble award. If we talk about the Knight ranger in the past context, then back in the past a Knight used to serve as a bodyguard for the landlords, and in return as a payment used to be granted with the land only. Today is this article we are basically going to try to draw this legend ranger Knight on a piece of a paper, and we hope that this Knight Drawing tutorial would help you in drawing that. 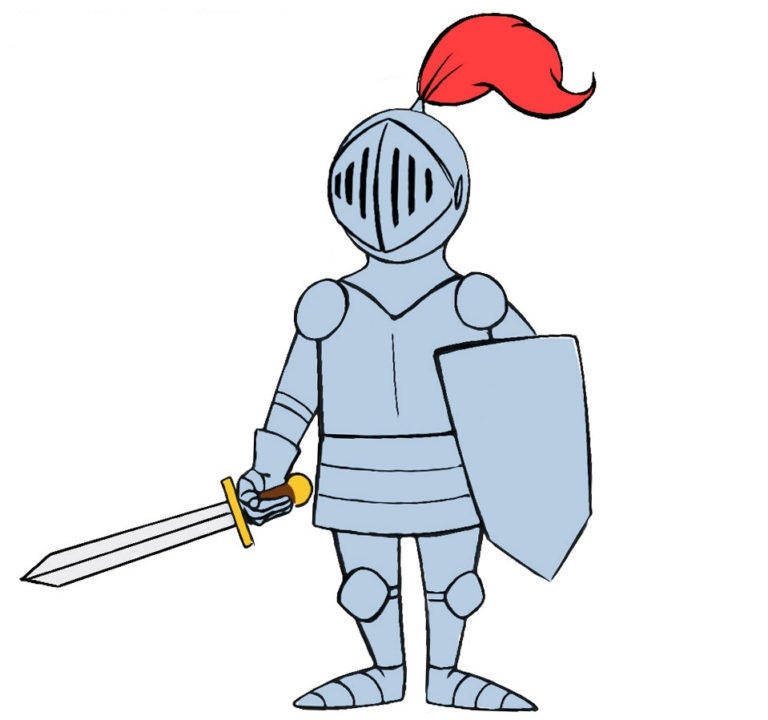 If you are a beginner and drawing the knight for the very first time then keep in mind that drawing the knight is almost similar to drawing the humans which is subject to slight changes such as with the knight you have to draw the weapons as well and the helmet or the armor also. If you are drawing the knight for the very first time then we suggest you to have a drawing of the knight with you to use that as a source of the reference. Keep the fine pencil, black and red markers, brush and a piece of paper with you. In the below sections we would provide you to draw the step by step drawings of the knight just follow that and enjoy your first trail to draw the knight. 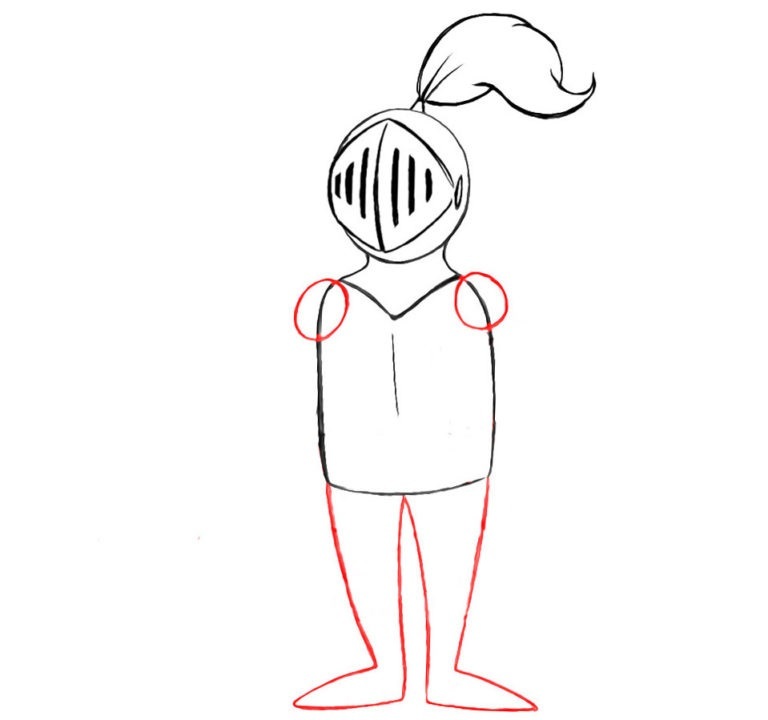 The easy way to draw the Knight is first practice how to draw a human frame, since the Knight can be easily drawn from the same human frame with some slight changes to that. 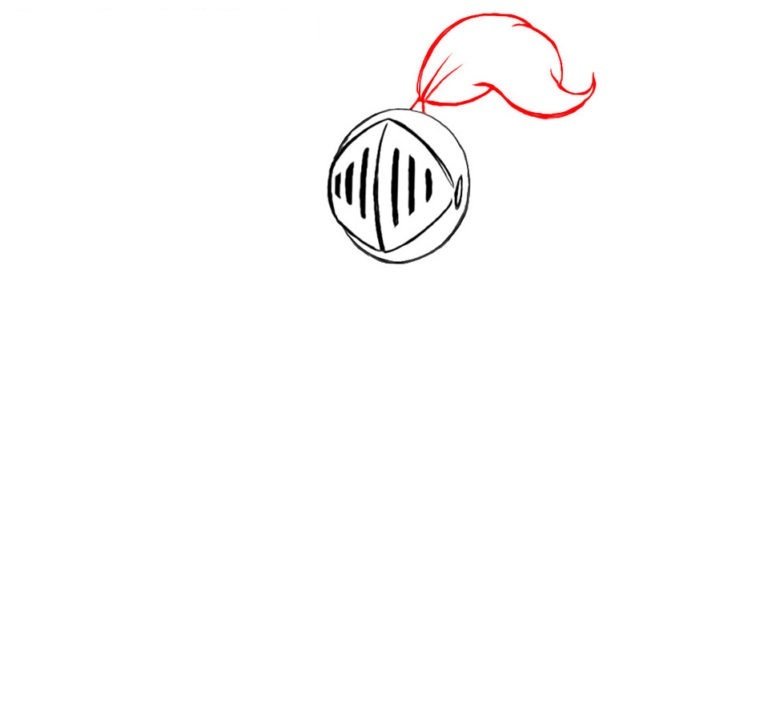 Here we are providing you the easy way to draw a knight. 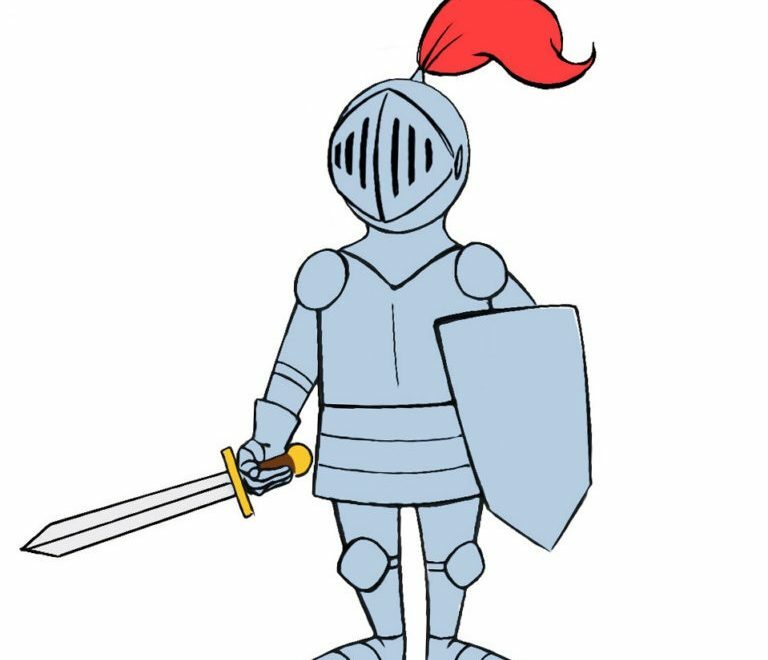 First of all we need to draw the skeleton of the Knight and keep in mind that the skeleton should be drawn straight so as to give the warrior look to the knight. After drawing the skeletons then just sketch the weapons of the Knight that are the sword and the shield. 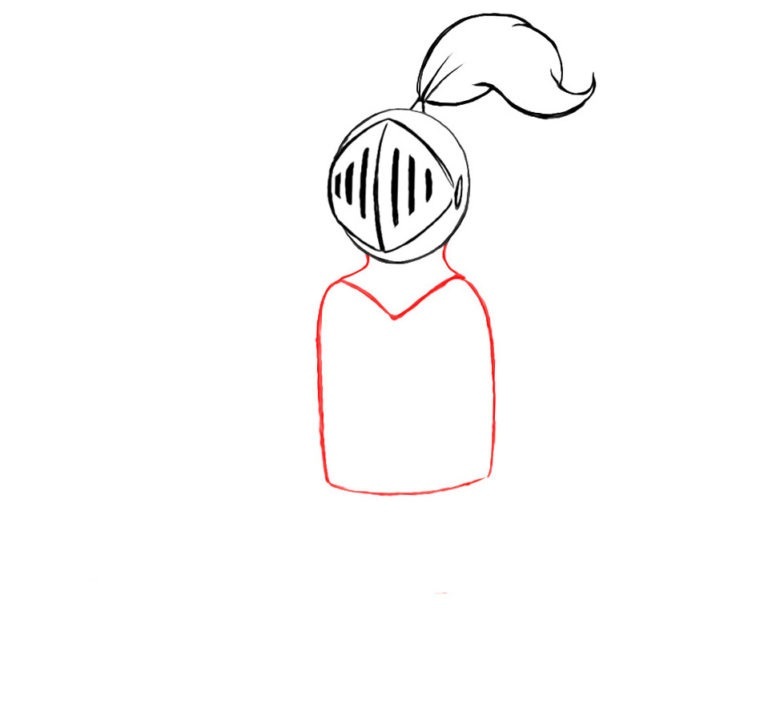 After that give a shape to the helmet over the face of the Knight and then draw the neck as well. Now draw the shoulder give a shrugged pose to the shoulders. Then come down and draw the legs and the feet easily. You can take a help of any knight drawing as a reference to help in drawing but go step by step. With this the helmet drawing is ready and you just need to paint it. 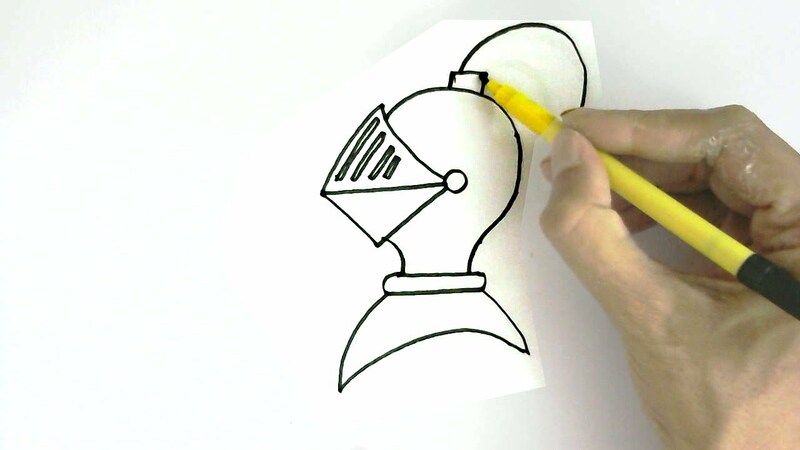 The art of drawing the Knight doesn’t differ much than drawing the human so we advise you that first you should know how to draw the human and then you can easily draw the Knight from the same shape of human. Draw a human by sketching the basic line for the human sculpture then shape the lines for the Knight. Add the additional lines to give the shape of knight from the human body. 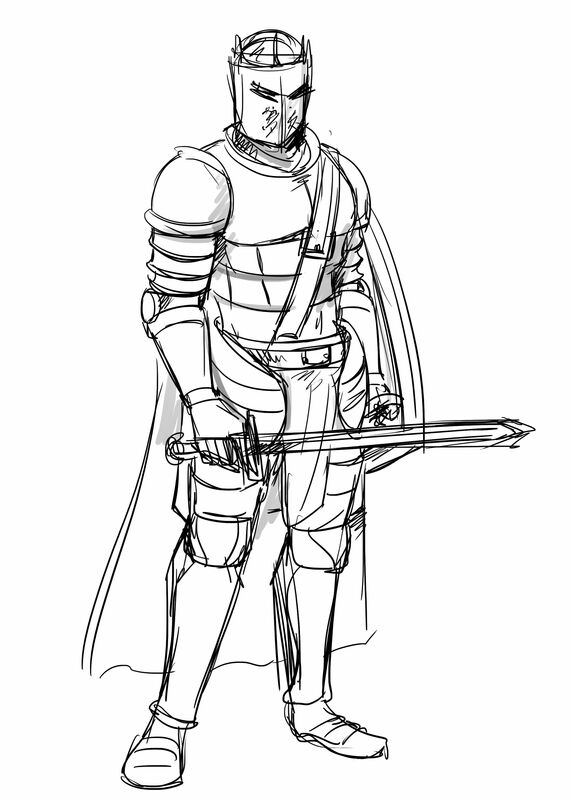 Next you need to sketch the weapons of the Knight that is the armor and then the clothing style. Further you should sketch the shield and the sword which are the standard weapons of the Knight. Next now you need to sketch the helmet keep in mind that the shape of the helmet is bucket based. 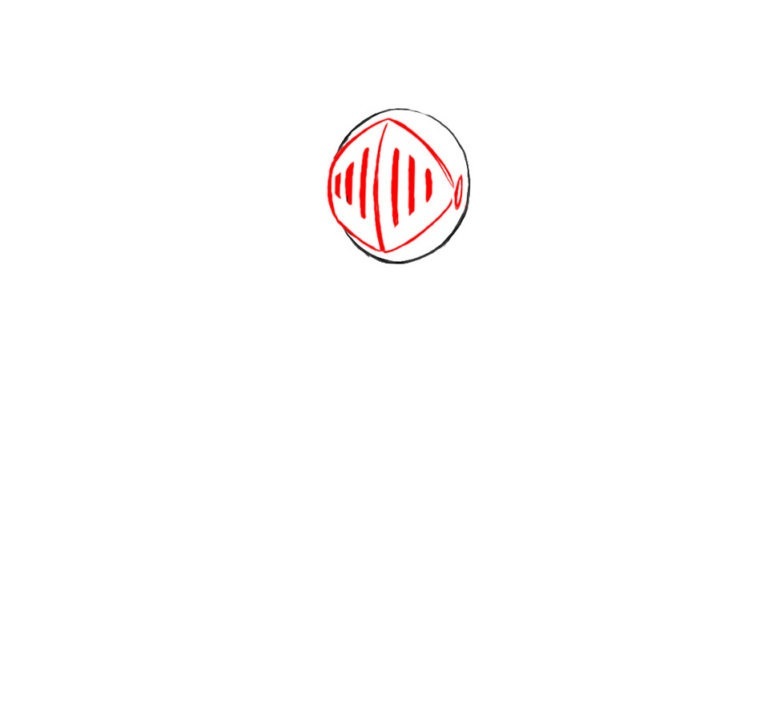 Now just use the black sketch to give the fine shape to the whole knight drawing. 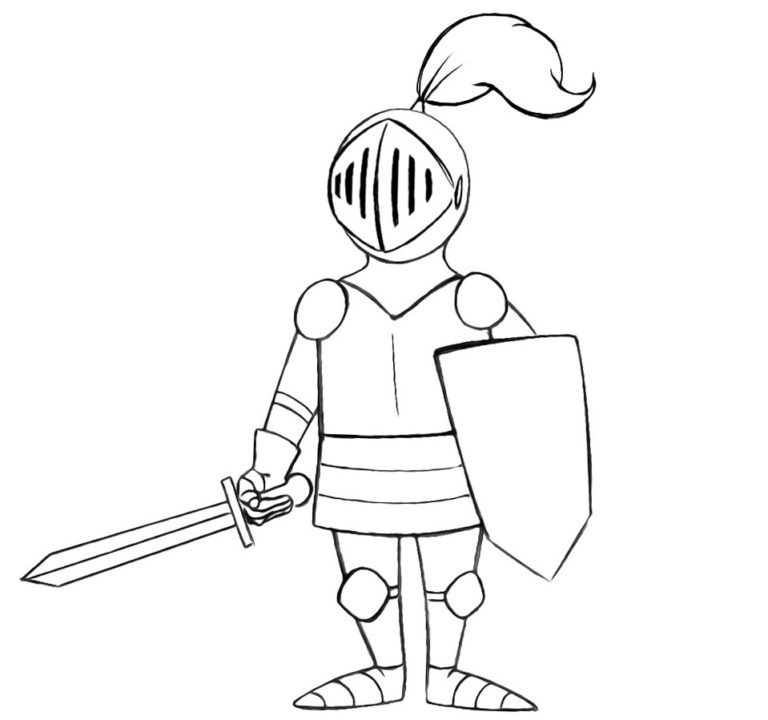 Then create some outline over the sketch marked to give the more appealing shape to the Knight. Now remove the sketch marks to prepare the final shape of the Knight for the coloring purpose. 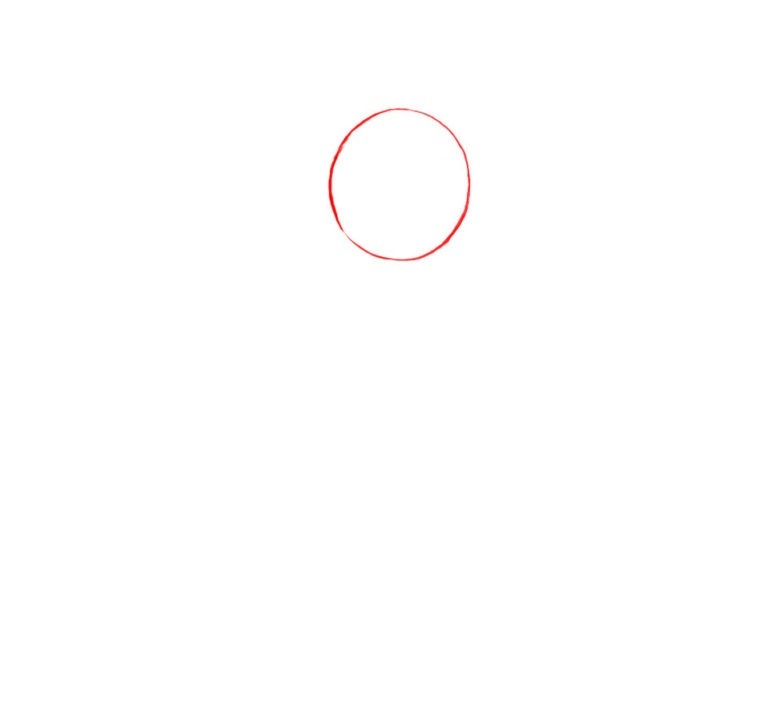 Now you just need to fill this drawing with the suitable choice of the colors. 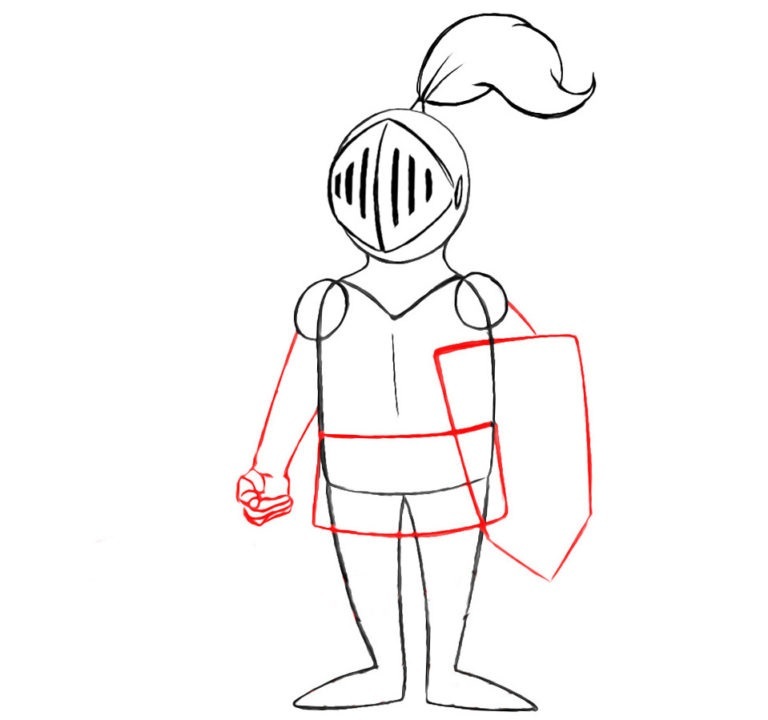 We hope that this tutorial to draw the knight would help you. Feel free to ask us for any further help.